My toes sink into white sparkling sand as a warm crisp breeze washes over me. I edge closer to the tranquil, crystal, clear blue water that surrounds this island paradise. In the water, tiny fish peek at my toes, and I think to myself, there is no place more breathtakingly beautiful than Trunk Bay, on the island of St. John. I continue exploring the underwater snorkel trail that extends out to Trunk Cay. Along the beach, several wayside exhibits provide information about the flora and fauna that are common to coral reefs. 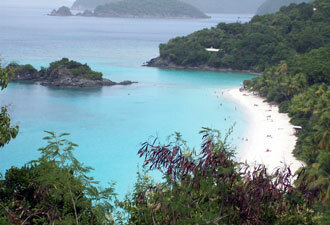 Virgin Islands National Park, encompassing approximately three-fifths of St. John, is famous for its beauty. Within its borders lie protected bays of crystal blue-green waters teaming with coral reef life, white sandy beaches shaded by sea grape trees, coconut palms, and tropical forests providing habitat for 800 species of plants. You can talk with rangers at Cinnamon Bay as they guide you through the island's rich cultural background, experience the night sky at tropical latitude, or even take part in the Ranger's Choice Monday programs to learn about the island's rich history, its native plants, and the animals that can be found here. At Cinnamon, the park protects the remains of the oldest known plantation on St. John—a cotton farm from the 1600s and the site of a 1733 slave revolt. Near the waterfront, archeologists have excavated the site of a caney, a probable temple or church/shrine, that had been inhabited between AD 1000 and 1490. 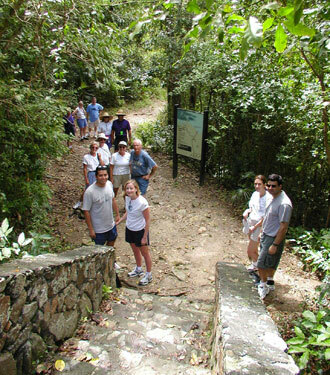 Hiking through the tropical forests on the three-mile adventure of the Reef Bay Trail, I imagine the pre-Columbian civilization that once thrived here and explore the remains of Danish sugar plantations. I sense that I too am a part of St. John Virgin Islands history as park rangers share the secrets of St. John's tropical forest, petroglyphs, and sugar mill ruins. It's exciting to hear rangers share the park's rich history; actually experiencing the lifestyle makes it that much better. Watching and learning how make “dumb bread” in a Dutch oven is rewarding; but washing it down with a sip of local flavor is refreshing. The gardener even gives a tour of the garden and shares the island's healing recipes, made from native plants. If you thirst for a tropical escape, consider a trip to Virgin Islands National Park, open year round. Whether it's the adventure of scuba diving, snorkeling and windsurfing you seek, the thrill of exploring ancient sites or the lure of pristine white sand beaches, you might just find the perfect cure here.